A German tourist has been trampled to death by an elephant as she tried to photograph the animal in Zimbabwe. Authorities in Zimbabwe say the attack occurred on Wednesday in Mana Pools National Park and the tourist succumbed to her injuries later the same day. The woman was in a group of tourists who encountered a herd of elephants upon entering the park. 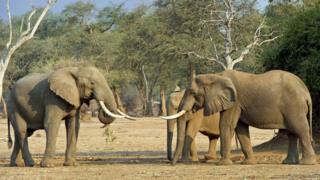 Elephant attacks are common in Zimbabwe, where they often come into conflict with local farmers. The woman has not been named. According to Zimbabwe Parks and Wildlife Management Authority spokesman Tinashe Farawo, the authorities are yet to establish what irritated the animals and led to the attack. "We are always asking people to stay away from wild animals; they should keep a safe distance," he told the Associated Press. Last year a trained elephant trampled a tour guide in Victoria Falls, a tourist resort in the country's west. Another local man was also killed in a separate incident last year after he had tried to drive elephants into the open to take pictures, reports the AFP news agency. Zimbabwe has the second largest elephant population in the world at 82,304 according to the Great Elephant Census of 2016.
Who has the most African elephants?